Each decade has its own rich history, culture and vibe. At More Than Paper, we are partial to the 1980s. When we think of this great decade, we think big hair, lots of hairspray, banana clips and scrunchies, stone washed jeans, jelly shoes, Doc Martens, and neon bangles. We think The Breakfast Club, all movies with Molly Ringwald, Top Gun, and Madonna. Wouldn't it be fun to have a girls party throwing back and paying homage to the 80s? 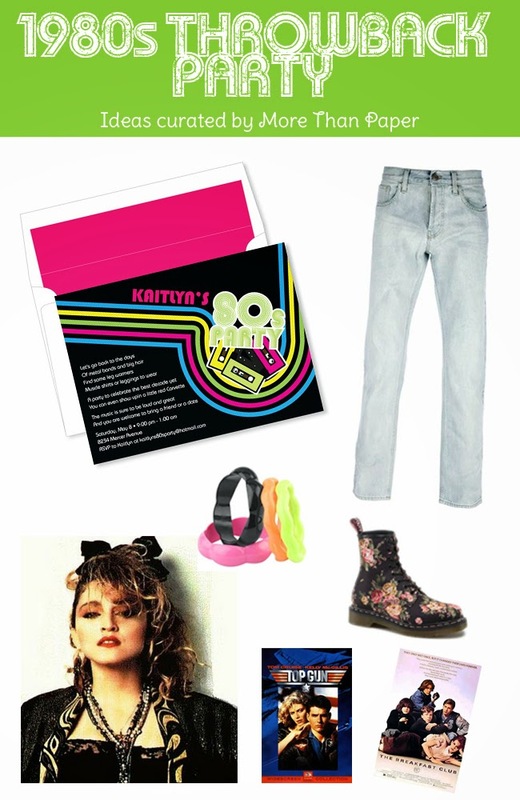 We found the perfect invitation and are inspired by throwback clothes and entertainment to plan an 80s girls night that will totally rock. Be sure to wear your neon bangles, stone washed jeans, and Docs (if you are still lucky enough to have them!) Invite the girls over for a night of drinks, listening to Madonna and playing good old movies like Top Gun, The Breakfast Club, Sixteen Candles and other Ringwald movies. Serve your favorite drinks and food and have fun with your friends -- 1980s style! Do you have a good idea for a party? Tell us your favorite unique party ideas!